One of the most beautiful apartments in Sellin best location! 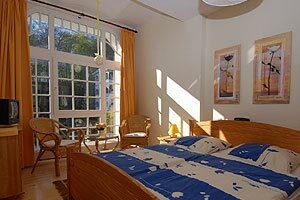 Situated in the historical Wilhelm Street - the most splended villa-avenue in the typical architecture of Rügen, only 650ft (200m) away from the main beach and the famous pier. Just behind the house the Sellin Forest begins. 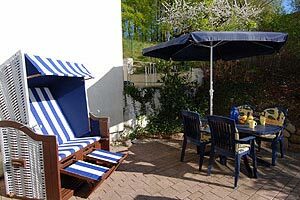 The very exclusive apartment**** which sleeps 2-3(4) people is tastefully furnished completely in a romantic country style. Due to its comfort and the fireplace, this apartment is also in the winter / low season one of the best places and specially suited for long stays. • separate oriel for dining with views of the Wilhelm street and the spa gardens. • The dwelling meets the highest comfort (4 star) for 2-3 people. • On request also an occupancy for 4-5 people is possible (double sofa bed in the conservatory and living room), however, the quality of comfort then reduced to 3-star, when the living room serves as bedroom. If you order this apartment, you'll get a „little fairy tale“ in the beautiful resort Sellin, which is lovely called "Pearl of Rügen“. 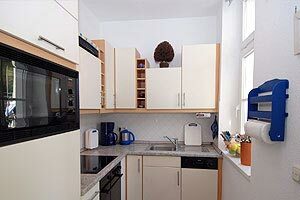 The equipement level is of much higher quality than the usual standard of holiday apartments. Enjoy your meals from the oriel for dining while the beautiful view from the monument in the style baths shaped windows on the historic William Street and the opposing peace mountain park. A feast for the eyes is the living room with natural wooden furniture in colors of terra cotta, natural and blue. All furnishings are perfectly color coordinated with lots of love and harmony. You will be given in all respects an exceptional comfort, if you just sit in front of an fireplace with a glass of red wine, listening to music, watch TV or spend an evening with one of the available games. Absolutely you should look at the dvd on Sellin from the 30's and Rügen Island, which present an overview of all the attractions and natural treasures, you can visit during your holidays. You also can rely on a good selection of available music CDs and DVD movies, or plug in your own music and via the USB-Port (MP3/I-Pod) on the multimedia sound system. Is there anything better than to start the day with a breakfast on terrace, while birds are singing in the beginning forest just behind the Villa Li. There is nothing be missed on the south-west 30sqm terrace with seatings, deck chairs and beach chairs and in the evening barbecue party starts with a view to the setting sun. The apartment has a separate kitchen, which leaves little to be desired. Dishwasher, microwave, ceramic hob cooker, 4 *- freezer, rice cooker, waffle iron, blender, toaster, kettle, coffee maker, espresso / PAD machine, radio, baking items and a standard range of spices are available. 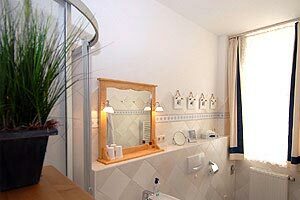 In the bathroom with shower and window, you will find a romantic décor in Antique white and blue with natural accents, towel warmer, vanity mirror, radio and hair dryer. In the bedroom with yellow tones and natural wooden furniture is a large wardrobe, TV, DVD and music system with USB, an additional seating area, iron and ironing board. Through a four-year-bed system provides a various tmperature all year. Also in the bedroom you will find some nice decorative details. The romantic conversatory is also the third place to sleep and for many guest it is the most beautiful place in the house. Here you can retreat to read. 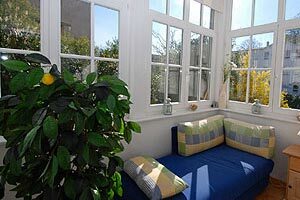 You will find in the conservatory, a double sofa bed in the lounge chair-style, a CD / radio and a well-stocked mini-library.